One would think that someone with a merchandising background would enjoy volunteering at the Heritage Stores. One would be right! “I love it. I meet people from all over the world and it’s right up my alley with merchandising,” Ardys Roseland said about volunteering in the Heritage Stores at the Cultural Heritage Center and the Capitol. Ardys grew up in the Harrold area and went to country school for eight years. She attended middle school and high school in Pierre. She graduated from South Dakota State University in Brookings with a major in textiles and clothing. She has been married to her high school sweetheart, Marlin, for 41 years. After they both graduated from college and married, they moved to Rockford, Ill., where they lived for 11 ½ years. While in Illinois, Ardys put her merchandising background to use by working for Marshall Field & Company, the Chicago-based department store. Her daughter, Whitnea, was born while living in Illinois. A job change for Marlin resulted in the Roselands returning to South Dakota. Ardys started working for the South Dakota Department of Health. She worked there for 29 years, retiring in January 2015. 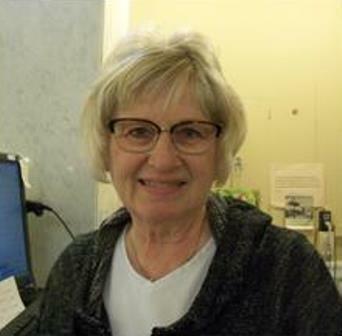 At the urging of her neighbor Connie Grittner, Ardys began volunteering that March at the Cultural Heritage Center. She usually volunteers two Thursdays a month at the Heritage Store at the Capitol. Ardys also volunteers at Jefferson Elementary School with Harvest of the Month, a program that promotes fruits and vegetables. She is a Reading Buddy at Stanley County Elementary School. She enjoys spending time with her family, which includes twin granddaughters Anna and Kayla; quilting, reading, and attending races with her husband.